This 10 x 17 metal workshop has single and double doors that allow various points of access into the building. This means you have massive flexibility with the unit, and can therefore adapt it to your own needs. 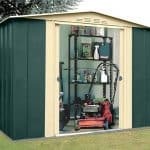 Quality materials have gone into the building itself, so you have a workshop that has great structure and durability. This is backed up by a 20 year guarantee against rust and perforation. Ventilated gables, a 3 coat paint finish and high tensile steel construction make this one of the highest quality buildings you can invest in. This is a heavy duty, large workshop with a stylish apex roof. The style and shape of the roof makes sure that falling rain water runs diagonally down, straight onto the ground below. As it doesn’t have chance to collect or run down onto the sides of the building, this minimises the risk of rust. One of the many benefits of this building is the fact it comes with extra tall eaves. They measure 1.77m, while the roof measures 2.03m. This means that centrally throughout the interior of the workshop, you have plenty of extra height to work with. This makes storing larger, taller tools and equipment a breeze. Of course it also means if you’re a slightly taller than average individual, there’s no risk of bumping your head; making it a lot more comfortable to walk around in. Other measurements to be aware of are the doors, width and depth of the building. The doors are built to provide a good deal of space to access the building, measuring 1.30m wide and 1.68m high. Meanwhile the width at 3.07m and the depth of 5.26m give you plenty of interior space. The workshop benefits from high tensile steel construction, giving it a particularly high level of protection against the elements. It has a unique, vertical style cladding and has been finished with a 3 coat paint job for extra durability. Everything about this building has been made with weather protection and rust resistance in mind. The steel helps to ensure you have a sturdy, strong frame that will withstand a high level of wear and tear. It also means no matter what the British weather throws at it, the building will remain strong and undamaged. A floor doesn’t come with this building so that is something you need to take into account. This has both advantages and disadvantages. The positive aspect of a floorless workshop is that you can store really heavy tools and equipment without worrying about damage to the floor. However, the downside is the fact that it has to be built on an extremely solid surface such as concrete or paving slabs. So if you only have a grass lawn, you will need to invest in pacing slabs before you build it. This obviously means you will be paying more for the workshop which isn’t ideal if you are on a budget. No paints, preservatives or treatments are required on this building. This is one of the best advantages of this model in our opinion. After all, who wants to worry about regular maintenance and additional costs that come with annual treatments? The building has already been covered with a 3 coat paint finish. This helps to protect every single panel, ensuring the elements don’t affect the steel framework. Another thing that has impressed us with this model is the 20 year warranty against rust and perforation. 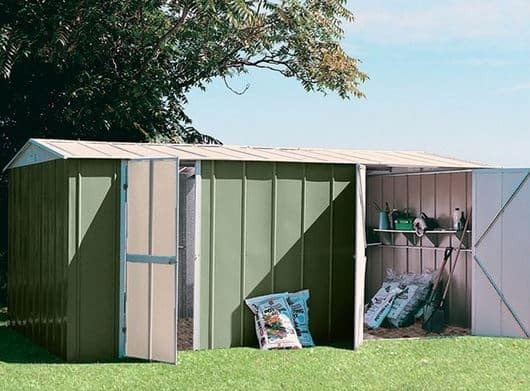 You will notice a lot of metal sheds in the Waltons collection feature a 10 year warranty. So this 20 year guarantee shows you what kind of quality can be expected. Access into the building couldn’t be easier thanks to its 3 door design. All of the doors are featured on the front of the workshop, just at different ends. They aren’t just your standard doors either. They have a reinforced design for additional strength, security and stability. There is a distinct lack of windows on this workshop which again provides both bad and good points. On the plus side it gives you privacy to work and keeps any valuable equipment hidden from view. On the downside, it means there isn’t much in the form of lighting. So if you are using it as a workshop and not a simple storage space, you will likely need to invest in an electrical pack. As it doesn’t have windows, one thing you might be worried about is condensation. Waltons have this covered however and have provided ventilated gables to prevent condensation without compromising security. We are really impressed with the secure and private features of this building. The reinforced doors make it a lot harder for would-be thieves to break into. The overall structure of the workshop is also incredibly tough so there is little to no chance of breaking that down either. Then there’s the fact that there are no windows so your stored equipment and machinery will be safe from prying eyes. 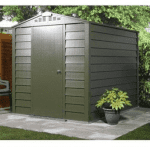 With all this in mind, we highly recommend it for anyone wishing to store valuable equipment or those who simply want to enjoy working in total privacy. Very few customisation options are included with this workshop. However, the simple truth is you don’t really need much else due to the quality of the building. It is already secure, private and water-resistant. However, the one thing that you can invest in is an anchor kit. This is actually really useful as it ensures the base of the workshop is secured tightly to the frame. 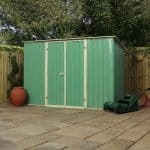 Of course, the galvanised steel structure is really tough to blow over anyway, but it’s always good to have that little bit more peace of mind. 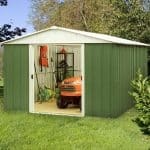 This workshop has been built using the highest quality materials. A lot of attention to detail has been given to both the exterior and the interior of the building. The high tensile steel ensures this workshop is protected against rust for a minimum of 10 years. It also protects the building against damage from the elements. Taking into account you don’t need to add additional levels of protection via preservatives and paint, its longevity is really impressive. It’s hard to imagine just how spacious this workshop really is. Once assembled you’ll find it boasts an incredible amount of space. It is also strong enough to have shelving attached which provides even more storage potential. The one misleading thing about this workshop is the fact that the manufacturers claim it can be built quickly. Don’t be surprised if this building takes a whole weekend to construct. It is a large, heavy building and while the instructions are pretty well detailed, it is still going to require a lot of heavy lifting. While this does offer excellent value for money, you do need to take the high initial purchase price into account. 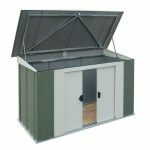 It isn’t the cheapest workshop on the market, but it is one of the highest quality, most durable models available. As you won’t have to spend any money on seasonal treatments, that also adds to its overall value. If you can afford the purchase price we do feel this is a very good value for money building. Final Thoughts: This long workshop has a substantial amount of space to set up a work station. If you plan on using electric machinery you will need to upgrade with an electrical pack. 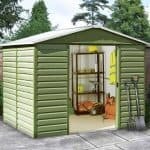 However, if you’re storing general non-electric equipment and tools, you’ll find this an excellent value for money option. It has some great features which add to its durability and security. It ranks highly in all sectors and comes with everything you could possibly need in a workshop.